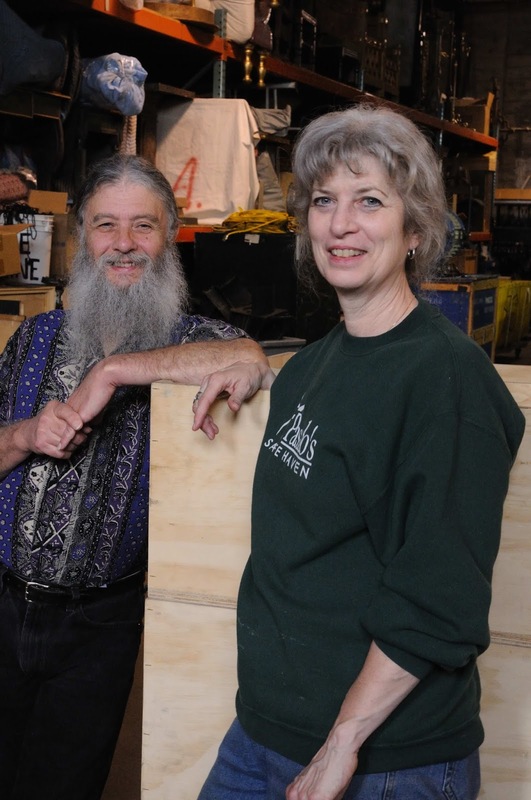 Jack and Sandy Burke have been married for 16 years and working together at Seattle Opera for nearly as long. Sandy, who “learned to use tools at an early age,” first worked for Seattle Opera in 1977 as an electrician, and has been Assistant Properties Manager since 1986. Jack—a former musician turned sound engineer who has worked with such artists as Dizzy Gillespie and Yo-Yo Ma’s Silk Road Ensemble— has been the Sound Designer and Audio Engineer since 1996. They sat down with me to talk about the life of a theater “techie,” backstage romance, and why stagehands dress in black. Jack, why does Seattle Opera need a sound designer/audio engineer? The singers aren’t using microphones, are they? Jack Burke: None of the principals are ampli­fied, but there are other sounds that need to be dealt with. During performances, the singers actually can’t hear the orchestra, so the sound is fed through speakers that are onstage and kept at such a low volume that it doesn’t affect what the audience hears. There are also some instruments—harpsichords, lutes—that need amplification or they’d never be heard. I also design sound effects, like the strafing jets and bombs in Amelia. And Sandy, what does your job entail? Sandy Burke: I build, modify, and repair props. I’m involved in the planning and ac­quisition of materials, I maintain the orches­tra pit when we’re in McCaw Hall, which includes cueing the conductor to enter the pit at the top of the show, and I work backstage at all performances. Once the directors, conductors, and designers give you their ideas, what’s your next step? JB: For some effects, I’ll take sounds from a sound effects library and manipulate them to suit my needs. For others, we’ll create the sounds acoustically. Then I determine where in the house or onstage I need to place speak­ers to give sounds the correct orientation for the audience. SB: In most cases, I’m being asked to make things before rehearsals begin, so the director and designer might not have an exact idea of what they want, and instead give me general ideas. Basically, I have to try and read their minds—I’ve been pretty lucky so far. SB: The Icarus wings I built for Amelia were the most difficult and most gratifying project I’ve ever done. One of my favorite things about my job is that quite often I get to make something for which there is no prototype—things that have never existed, they’re just in the imagination of the direc­tor and designer and I have to create them. It’s really, really fun. How much lead-time do you get to create these things? SB: It varies, but I usually get about three weeks before items are needed in rehearsal—that’s for anything from furniture to the potion cup in Tristan. JB: I don’t get information until about two to three weeks prior to opening. So it’s a very intense and constantly evolv­ing process. For Amelia, a sound cue was added 15 minutes before opening night, so I had to quickly figure out which sound to use and which speaker to send it through. Generally, when we get in the house, the tech department schedule is from 8 or 9 in the morning until 11 p.m. for two weeks. Do you find that the theater lifestyle is diffi­cult for relationships? JB: With the kind of hours that we keep, it’d be difficult to maintain a relationship if you’re not both working in the industry. There are times when Sandy’s working at the Opera’s administrative building and I’m off doing other shows, and we literally don’t see each other for days at a time. In your careers, Sandy, you’re more visual, while Jack, you’re more electronics and audio. Does that carry over into your home life? SB: I have the “Honey Do” List: “Honey do this, honey do that” [they laugh]. But Jack put in all the dimmer switches on our lights. JB: I do sound stuff, electronics. So it’s a good balance. It sounds like your jobs involve a balancing act as well. JB: Absolutely. When I’m backstage during a show, I’m routing sound effects— pre-recorded or those played live by a musician—to the appropriate speakers. So there’s a lot of interaction. SB: A lot of technology. Things you wouldn’t really think about sit­ting out in the house. SB: And you shouldn’t be thinking about it. JB: Right, that’s the point. If I do my job the way it should be done, no one knows that I’m even there. SB: That’s quite true of lots of backstage tech­nical jobs. The audience is not supposed to be made aware of the nuts and bolts of making these things happen, they’re just supposed to enjoy the show. They’re not supposed to be saying, “I wonder how many people it took to get that thing on the stage?” It shouldn’t call attention to itself unless it’s meant to. That’s why we all wear black clothing back­stage—so we can’t be seen. This Staff Chat first appeared in Seattle Opera’s program for Tristan und Isolde in August 2010.